QUESTION: 'Cochrane Corner' in the November SAMJ highlights a Cochrane review that evaluated the effects of interventions for improving childhood vaccination coverage in low- and middle-income countries. : Which interventions increase the uptake of childhood vaccines in low- and middle-income countries? BOTTOM LINE: Health education, home visits and reminders probably increase the uptake of childhood vaccines in low- and middle-income countries. Worldwide, vaccination prevents three million child deaths annually and could do more if optimal coverage were attained. [1-3] However, vaccination coverage remains suboptimal in low- and middle-income countries (LMICs). We highlight a Cochrane review that evaluated the effects of interventions for improving childhood vaccination coverage in LMICs. Fig. 1 shows a logical framework for thinking through interventions for increasing coverage. The review included six studies (with 7 922 participants) conducted in Ghana, Georgia, Honduras, India, and Pakistan. Three studies focused on health education interventions: evidence-based discussions in communities on the importance of childhood vaccination; information campaigns in communities using audiotape messages and printed materials; and education in health centres on the importance of completing the vaccination schedule. Two studies assessed the effects of home visits to identify unvaccinated children and refer them to health centres and the training of immunisation managers to provide supportive supervision for healthcare providers, respectively. The sixth study evaluated effects of withdrawing monetary vouchers from mothers who did not vaccinate their children and a multifaceted intervention targeting recipients (monetary incentives), providers (quality assurance) and health system (provision of equipment, drugs and materials). 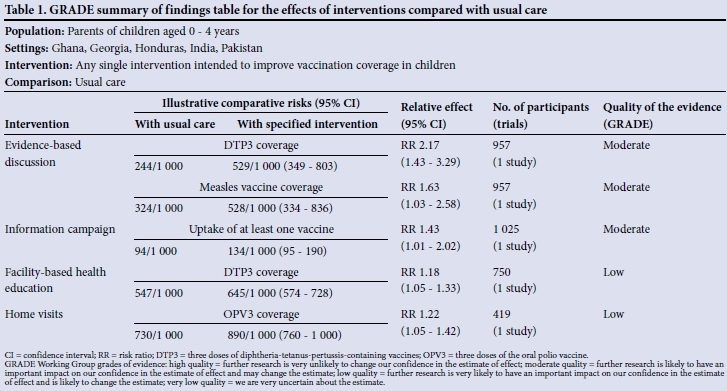 These studies show that health education (moderate-quality evidence) and home visits (low-quality evidence) can increase childhood vaccination coverage (Table 1), while recipient disincentives, training immunisation managers to provide supportive supervision, or multifaceted intervention lead to little or no difference in coverage (low-quality evidence). This is a well-conducted systematic review with only minor limitations. We consider that there was a high risk of selection bias in one of the included studies, because participants were not allocated to interventions at random. Two other studies were judged to have a high risk of detection bias, because people assessing outcomes were aware of the interventions to which participants were allocated. Review authors excluded parental reminders, as these interventions were already covered by an existing Cochrane review. The latter conducted comprehensive searches up to May 2007 for controlled trials conducted in any setting, and identified 47 studies. Sixteen of the studies focused on reminders to parents about their children's routine vaccinations. One study was excluded from meta-analysis owing to potential errors in analysis. Of 15 remaining studies (with 15 704 participants), 14 were conducted in the USA and one in Australia. Eight studies sent reminders through letters and seven used postcards, telephone calls, and home visits. This review found that reminders probably increase vaccination coverage (odds ratio 1.47, 95% confidence interval 1.28 - 1.68; moderate-quality evidence). The evidence shows that educating parents on the benefits of vaccinating their children, sending reminders to parents prior to planned vaccination visits, and contacting parents whose children have missed vaccination appointments all improve childhood vaccination coverage. However, there is a paucity of controlled trials from LMICs on interventions for improving childhood vaccination coverage. Future studies of parental reminders should include modern technologies such as mobile-phone text-messages.